After what seems like forever, I've finally got my life under control and back in order so back to doing what I love the most. I thought I'd kick it off with a couple of products I've been trialling out lately. As I'm sure you're all very aware, Soap & Glory and I are besties, everything I've tried I've loved (apart from the scent of Hand Food but I'm willing to forget about that if you do). From makeup to body scrubs to skincare they never fail to impress me so naturally I thought I needed to try a few more bits. 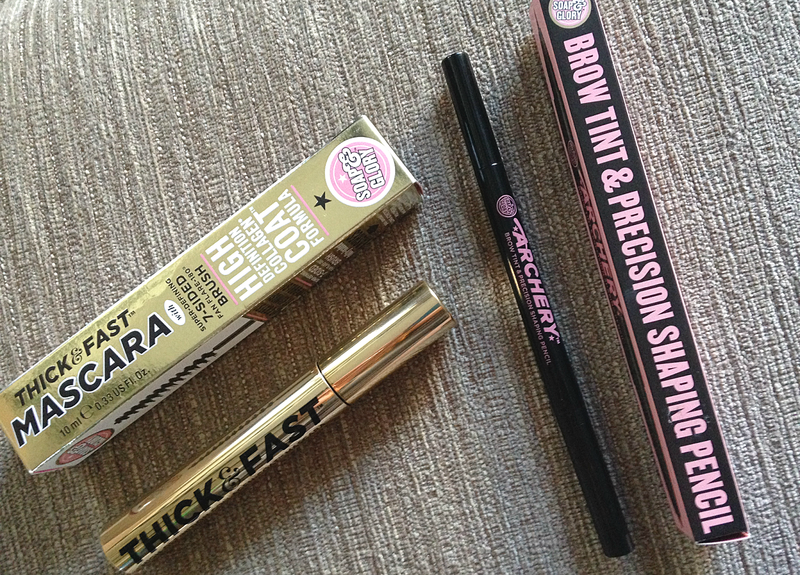 I picked up the Thick & Fast HD Mascara and the Archery Brow Tint & Precision Shaping Pencil - two products which I have seen so many bloggers rave about. I have a love hate relationship with these if I'm going to be honest. The Thick & Fast Mascara wasn't my cup of tea when I first tried it. I found the formula really wet and the brush hard to use so back into my stash it went. After a few weeks I rediscovered it and gave it a second chance. The brush? Still struggling to understand that but as for the formula having dried out a little bit, oh yes we're onto a winner. It creates thicker fuller lashes in seconds but effort is require otherwise you'll resemble a spider. As for the Archery Brow pencil, I love it. It's double ended pencil, a waxy side and a felt tip end. Oh and yes, my descriptions are just perfect I know. I personally love the waxy end more because it's easy and quick to apply on those days when I really cannot be bother. The felt tip side is good but it is a really faint shade. It's a shame it only comes in two colours because I've recently changed my hair colour so unfortunately it too light. Besides that, here are two products which I've fallen in love with and I would definitely recommend.